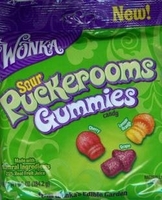 Wonka Puckerooms sour gummy candy. Sour gummy candy in the shape of mushrooms. Each bag of puckerooms has 3 assorted flavors grape, cherry and a orange / lemon combination and has 3 different shaped mushrooms. Each gummy candy is coated with a sour sugar coating giving them a tart and tangy taste. These are a new wonka candy from the editable garden line. These are an all natural candy made with no artificial flavors or coloring and even have real fruit juice. Each Bag is 6.5 oz.